For kicks I answered all of them wrong and got, "You're out of this world"
7/10. Not bad I suppose since I haven't read the books in several years. I can't get the "not a full towel" phrase out of my head. Next time somebody says something crazy, I think I'll use it. Child A: Will you buy me my own iPhone? Me: Ha ha ha! Kid, you're not a full towel. Child A: Um... I'll ask dad. Yay! I won the CrashPlan Facebook contest! I can't wait to get my towel. Fitting, I suppose, considering your age is on the towel. I lost, so no special Towel Day towel for me (other than the one that never arrived from Finland). Maybe they did send it, only it's invisible. Finish invisibility towels are all the rage, I hear. 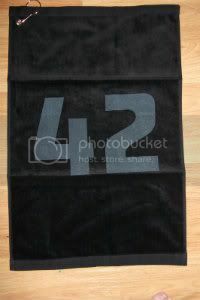 Here is the towel I won! I'm Jealous - is there no such thing as jealous smiley? Speaking of that tweet, it was the one of two Grammar Girl related tweets I got on the same day. The other was an interesting list of tricky Grammar issues. http://www.writersdigest.com/whats-new/the-13-trickiest-grammar-hang-ups I particularly liked that idea that using they & their as singular pronouns is starting to become acceptable. Oh wow, that's a cool article. My husband and I were recently arguing about the "next Wednesday" thing. It's just about that time when contests and such should be appearing here and there. I will be on the lookout. If you see one I missed, please share. "Fan of HHGG? Does Towel Day mean anything to you? If it does, send a picture of you and your towel by Fri 24 May for your chance to win an official HHGG tshirt and don’t forget to book for the show when it comes to Nottingham Royal Concert Hall on Fri 15 Nov. Send your entries to towelday2013@gmail.com with TRCH in the subject line and remember, DON’T PANIC!" I didn't find anything to indicate that you had to live in England to win, but then we all know how my towel from Finland turned out. "In celebration, we would like to give you the chance to win a very special HHGG T-shirt. Just send a picture of yourself with your towel to towelday2013@gmail.com before May 25 and make sure you put 'Hackney Empire' in the subject line. Best photo wins - so BE CREATIVE!" I noticed that the email address is the same as the Nottingham contest, but you put in a different subject line. Not sure if this means there are two contests with more shirts to be won or just one contest. This has a daily Facebook contest & Twitter contest starting on the 20th. And this contest ends Tuesday, May 21st (5pm BST, so Tuesday morning in the US). To enter, you design your own beach towel on the web site. 5 best designs get a beach towel with the design you made.